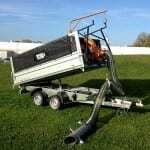 The VT450S is a vacuum trailer based on a standard trailer for fast traffic. The standard trailer is mostly made of aluminium and has therefore a loading capacity of more than 2,500 kg with a gross weight of 3,500 kg. The trailer can tilt electric-hydraulic to 3 sides. The vacuum unit is fixed to the front of the trailer. The vacuum unit can be (dis-)mounted in 5 minutes without tools. The trailer has standard a tunnel for optional ramps. The VT450S is the first vacuum trailer that is year round deployable for a variety of jobs.